Harman Becker Automotive Systems GmbH's latest-generation multimedia interface 3G-infotainment system comes as an option on the new Audi Q5 SUV. As part of the upgrade to Audi's MMI (Multi Media Interface), Q5 owners who choose the option get built-in iPod connectivity as well as other features. The MMI system starts at 2,100 euros in Germany. Harman Becker currently provides infotainment systems for a range of Audi models as well as the Touareg SUV from Audi sister brand Volkswagen. The components are made at the supplier's factory in Straubing, southeast Germany. Robert Bosch GmbH supplies the Q5's adaptive cruise control and electronic stability control. The ESC has a number of advanced features. For example, in wet weather the system engages the brakes imperceptibly to remove moisture from the blocks, giving a more responsive and safer ride. When towing, the system predicts whether the trailer is about to fishtail. In such an event, the ESC prevents this from happening by engaging the brakes. Furthermore, the ESC compensates for the fading effect that occurs when the brakes are hot, which is more likely to occur when a vehicle is heavily loaded. Brose Fahrzeugteile GmbH & Co. KG gained new business with the Q5's manual rear-seat adjuster. The product has two versions. The standard fit allows the seat to be set at the desired inclination or to be folded. The higher-end option has the standard functionality in addition to a length adjustment feature, which allows occupants to choose between more legroom or more space in the trunk. Brose expects fitment rates of 60 percent for its basic system and 40 percent for the high-end version. Emhart Teknologies Inc., a U.S.-based subsidiary of American power tool maker Black & Decker, provides wheelhouse covers to the Q5 that can be attached with a new "no-hole" fixation method that uses plastic clips on T-shaped studs. This approach allows for tool-free assembly and is cheaper than the conventional method, which requires the holes to be sealed eventually. The technique improves the vehicle's impermeability to water. 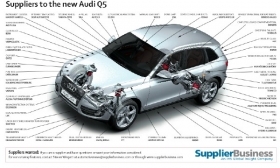 Audi assembles the Q5 at its plant in Ingolstadt, Germany. The SUV was launched at the end of 2008. The starting price in its home market is 36,500 euros.